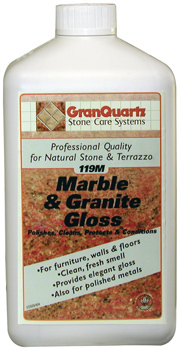 Genesee Cut Stone & Marble Co.
Easy and safe to use, helps resist water spots and stains and will not build up with repeated use. Also great for chrome, brass, and stainless steel. Helps to prevent hard water spots. Use for both indoor and outdoor applications. 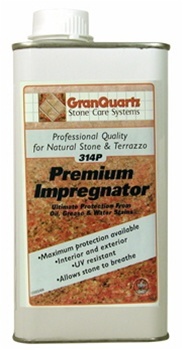 A silicone impregnator suitable for use on all natural stones regardless of finish type. Use 314P for both interior and exterior applications for maximum protection from oil and water borne stains. 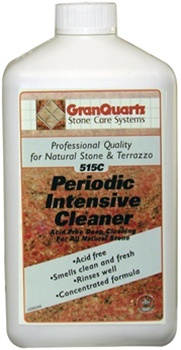 The highest quality stain protection available, 314P allows the stone to breathe naturally, cures quickly and offers a totally natural appearance. 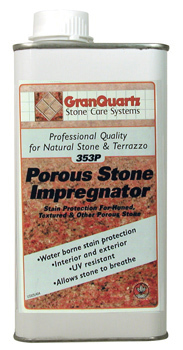 353 P offers maximum protection from water borne stains for porous stone. It is a silicone impregnator specifically formulated for honed and textured stone and is also excellent for masonry surfaces and unglazed clay tiles. Used for both interior and exterior, 353P allows stone to breath naturally, cures quickly, offers a totally natural appearance and requires no special equipment to apply. 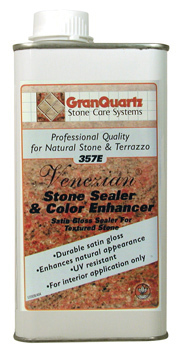 A modified acrylic sealer/color enhancer intended for use on textured stone only. 355E cures to a hard, durable finish that enhances the natural appearance of the stone without gloss and protects it from oil, grease and mineral deposits. For both interior and exterior applications, 355E is UV resistant and allows the stone to breathe naturally. 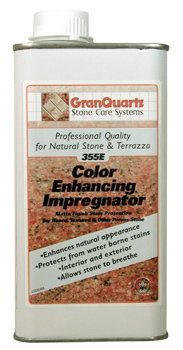 A modified acrylic sealer/color enhancer intended for use on textured stone only. 357E cures to an ultra hard, durable finish that enhances the natural appearance of the stone with a satin gloss and protects it from oil, grease and mineral deposits. Use 357E in all interior and exterior applications where color enhancement is desired. 357E is UV resistant and allows the stone to breathe naturally. A silicone wax based polish that cleans, protects and conditions any polished stone or ceramic surface. Ideal for maintaining polished natural stone bar tops, furniture, shower stalls and fireplaces as well as polished metals like brass, bronze and aluminum. 119M may be diluted for floor maintenance, and buffs to a beautiful gloss. An extra strength de-greaser, cleaner and grout film remover that is suitable for all natural stones including polished marble, granite, travertine, agglomerate and ceramic tile. 515C can be used as a periodic deep cleaner where heavy soiling is present, for construction job site clean up, or for removal of grout residues and soap scum deposits.